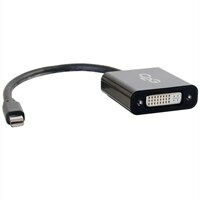 This adapter allows the Mini DisplayPort video output of a laptop to connect to the DVI-D input of a display and is perfect for applications including displaying video on an HDTV, projector, or monitor in a classroom, on a desktop, or in a meeting room. This Mini DisplayPort to DVI-D active adapter can be used in either DisplayPort single-mode or dual-mode outputs, providing the conversion for a Mini DisplayPort source even when that source does not support DP++. Active Mini DisplayPort conversion is excellent for applications where multiple Mini DisplayPort adapters are required to connect to a single graphics card. This allows every active adapter to interface with a corresponding display. Note: When this device is connected to a Mini DisplayPort source device that supports audio and a DVI-D to HDMI Cable with the HDMI connector plugged into a HDMI display device that supports audio both audio and video signal will be transmitted from the source device to the display device. However connecting to a DVI-D display will not allow audio to pass to the display. Note: When this device is connected to a Mini DisplayPort source device that supports 4K signal and a DVI-D to HDMI Cable that supports 4K with the HDMI connector plugged into a HDMI display device that supports 4K video signal full 4K video signal will be transmitted from the source device to the display device. However connecting to a DVI-D display will not allow 4K resolution to pass to the display.